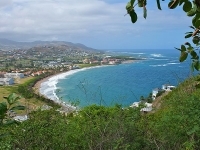 Known formally as Saint Christopher Island, Saint Kitts was named by Christopher Columbus on landing there in 1493. But it was not until it became an English colony in 1623 that its name was shortened to Saint Kitts. A lush and verdant island, Saint Kitts is the larger of the twin-islands that make up the country and is more developed than Nevis. However, neither has succumbed to tourist trappings, remaining an unassuming and uncrowded destination that is a true gem in the Caribbean crown. Dominated by an extinct 3,792ft (1,156m) volcano, the island is covered in green vegetation and sugar cane fields, and is ringed by sandy coves, coral reefs, and clear waters. Most beaches to the north are black and sandy due to the volcanic nature of the land. But southern beaches like Frigate Bay, Banana Bay, Sand Bank Bay, and Cockleshell Bay are deserted stretches of fine white sand. There's more to Saint Kitts than natural splendour and beaches. A history of slave revolution and colonialism during the 18th century left the island with a rich heritage of architecture, as well as sites such as the impressive Brimstone Hill, constructed to protect the wealthy of the island. During the heyday of the sugar industry, Saint Kitts boast 68 sugar plantations. The oldest and richest colony in the Caribbean, its prosperity finally ended with the abolition of slavery and its once-prolific factories and windmills lie in ruins among abandoned estates.